Does Justice campaign not care about the fines? Does the Democratic nominee for governor of West Virginia support the Democratic president and the Democratic candidate to be the next president? That’s the latest battleground in the race for governor, which has re-emerged with new TV ads and angry news releases after the political lull that followed the recent devastating floods. State Senate President Bill Cole, Republican candidate for governor, unveiled an ad this week that attempts to tie Jim Justice, the Democrat in the race, to President Barack Obama and Hillary Clinton. Justice said that his donations were to support the re-election campaign of Steve Beshear, then the Democratic governor of Kentucky, not Obama. His campaign was so eager to avoid the impression that Justice supported Obama that it sent a link to an unflattering article about environmental violations at Justice’s coal mines. 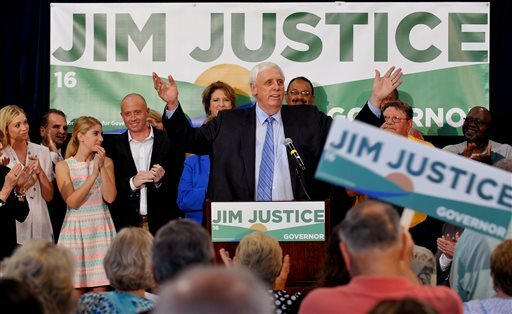 “The federal Office of Surface Mining Reclamation and Enforcement counts at least 266 pending violations in the five states against companies owned by West Virginia billionaire Jim Justice, who has hobnobbed with Beshear at Justice’s glitzy Greenbrier Resort, and who — with his family — has contributed at least $400,000 to Beshear political causes since early 2011,” said the 2014 article from the Louisville Courier-Journal, supplied by the Justice campaign. Nearly half of the unresolved violations — 129 of them — are in Kentucky, where an enforcement confrontation is coming to a head. The others are in Tennessee, West Virginia, Virginia and Alabama. “I would say, without going back and looking at all of the records, this is the most serious set of violations that I have seen in my seven years,” Kentucky Energy and Environment Cabinet Secretary Len Peters said of the environmental record of the Justice Companies. Kentucky regulators have been so frustrated by the sluggish response to their concerns about water pollution, failing to keep pace with reclamation activities and failing to pay fines, that Department of Natural Resources Commissioner Steve Hohmann has threatened to go after company officers’ own money for fines and to cover the cost of reclamations activities. At one mine in Letcher County, for example, state officials said there is nearly half a mile of “highwall” awaiting reclamation, a cliff carved into the side of a mountain. Reclamation is supposed to occur as the mining takes place. Any reasonable person would think this wasn’t information that the Justice campaign really wanted to be spreading around. Of course, he did win the primary. Maybe West Virginians don’t care about these kinds of environmental violations. But we also know that Justice’s companies don’t exactly make it a habit of paying the fines they rack up for worker safety violations. And despite his folksy talk, Jim Justice doesn’t seem to make it a habit of paying his bills on time, either. Now, Democratic readers are going to quickly tell me to shut up — I mean, what am I trying to do? Help Bill Cole? And I can’t but imagine I’ll hear from some Mountain Party diehards who will say this is one of the reasons they’re voting for Charlotte Pritt. But really, for West Virginia to get beyond our many problems, we need to stop acting as if it doesn’t matter that a coal company violates the law, racks up hundreds and hundreds of violations, and then tries to dodge paying their fines. Those aren’t our values. If there was an underlying theme to the prosecution of Don Blankenship, it was that the coal industry and its executives should simply be above the law. It’s no coincidence that the West Virginia Coal Association and lobby groups from Ohio and Indiana have weighed in on Blankenship’s appeal. And it’s certainly no surprise that their argument is that violations of mine safety rules are just part of doing business, and not something that should be subject to the same legal system as the rest of our society. Sure, we’ve got an election coming up and people have to make choices when they go to the polls. But our state also needs to make some decisions about how we view ourselves in relation to the coal industry. Telling coal operators — and their political campaigns — that racking up mining violations isn’t just part of doing business would be a fine place to start. Just discovered your blog. Reading back posts, your disdain for the coal industry is as clear as it is unfortunate.